A. H. Hirsch Reserve Straight Bourbon Whiskey is a legendary spirit whose rise parallels the revival of the American whiskey industry itself after nearly 30 years of flat sales and discouraged marketers. It's also the story of a small distillery in Schaefferstown, Pennsylvania, whose fame dates back to the 1750s, and whose final collapse prefaced its famous product's reign. Seemingly the story of a single product, it touches numerous strands of American history and includes a colorful cast of characters, from the whiskey-making Beams, to the giants of the post-Prohibition distilled spirits business, to the mysterious Mr. Hirsch himself. 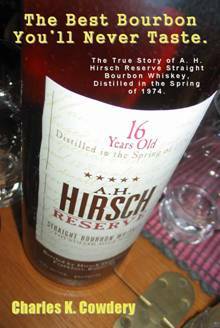 A great product needs a great story, and A. H. Hirsch Reserve Straight Bourbon Whiskey has that in abundance. It was only around for about 20 years and is now largely out of distribution but if you really want to taste it, that just might be possible. Charles K. Cowdery is one of the most acclaimed writers about whiskey and whiskey-making in the United States. He is a Kentucky Colonel and a 2009 inductee into the Kentucky Bourbon Hall of Fame. Complete bio. Amazon. Click here to order it from Amazon. For the ebook edition, Kindle and Nook set their own prices but the suggested retail price is $7.99. Click here to order it for the Kindle e-book format (Amazon). Click here to order it for the Nook e-book format (Barnes & Noble). Kindle ebooks can be read on virtually any format (Apple, Android, PC, etc.) except Nook, and Nook ebooks can be read on virtually any format except Kindle. Funny how that works out. The Best Bourbon You’ll Never Taste, The True Story Of A. H. Hirsch Reserve Straight Bourbon Whiskey, Distilled in the Spring of 1974, by Charles K. Cowdery, is available in print, or as an ebook for Kindle and Nook. The print edition is a trade paperback, 108 pages, ISBN 978-0-9758703-1-0. Price is $22.95, plus $3 USA shipping and handling, $25.95 total, for delivery to USA addresses. Please use the drop-down menu for shipment outside the USA. If you would like your copy signed by the author, indicate what you would like the inscription to say in the “inscription” box below.